Quote from the Movie Meet Joe Black: "Do I Blend in?" QR Codes like this you probably have seen before. The Background and the code is merged together as one single picture. The locator squires are kept at a higher contrast. When a Reader can find these locator squires, it will determine the size and start position and grid of the code. For each grid location the binary value will be determined, by checking if the location is predominantly light or dark. 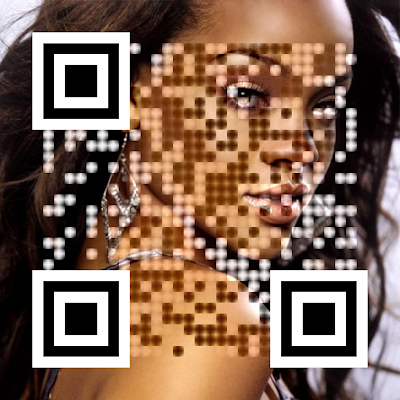 Points of the background picture that hold the a opposite or undefined level compared to the QR Code's content will be pushed to hold a definite light or a definite dark level. This pushing can accomplished by overlaying a dark or light picture on this grid position with just the right level of transparency to make sure any QR Code reader will read the right binary code for each grid position.correctly. The Art is to find the correct mask and selecting the best code settings so that the minimum amount of grid elements would be needed to merge the picture and the code. That way most grid positions of the background would not need adjustment, and can show the actual picture.